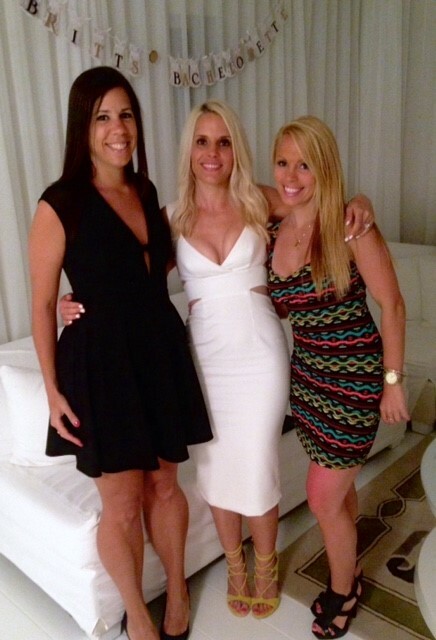 This past weekend, I spent a long weekend celebrating my sister’s bachelorette in Miami. One of the things I like the most was that in the planning stages she requested various classes that she wanted to attend while we were there. I am one of those people that genuinely ENJOYS working out and while yes I suffer from days where I have to kind of drag myself to it, I feel worse if I don’t move my body somehow. And let’s be honest, when you are in Miami and rocking a bikini the majority of the day – you WANT to do some sort of workout to feel your best (or maybe that is just me…). So luckily I was able to get in something each day. Friday – we started the day with an early morning Flywheel class and I wound up running and lifting at night while they got their blowouts (yay for Japanese straightening, a blowout is kind of counterproductive since it does not get frizzy at all). Sunday – I was CRAVING some alone time before leaving and ran a little over 8 miles (on the ‘mill because Miami humidity and heat is already ridic at 8am). Getting in something each day definitely had me feeling my best as I threw on my bikini! I know I don’t have a “perfect” body but, I am damn proud of the work I have done this year to try and whip it back into stronger shape. Then for eats, each night there was a dinner planned. It was nice knowing where we were going each night to plan ahead meal wise (especially since my Crohn’s hasn’t had me feeling that great). We hit up some great spots: Lure, Katsuya and Prime One Twelve – all meals to die for! Overall even though I am super tired and in post vaca coma I am happy that I was able to both stick to routine without feeling like an outsider because of it and also party it up! (I am way too old for the late nights – dinner wasn’t until 9pm each day, YAWN). AND obviously so much fun to celebrate with my sister! Exactly! I hate "winging" my meals. I prefaced the trip with the fact that I would have to have a toned down version of what was going on bc I went into it not feeling so hot. Surprisingly when I did drink the last night I woke up feeling fine which I was very thankful for - usually alcohol kills me and I pay for even one drink.